The gut microbiome evolves throughout life and is influenced by many different factors such as the environment, food habits, intestinal pH, microbial interactions, environmental temperature, stress, peristalsis, host secretions and immune response, and drug therapy, just to name a few.1 Both external and internal factors listed above play an important role in maintaining or disrupting gut health. Supplement with Digestive Enzymes: Digestive enzymes degrade macronutrients into absorbable components. Supporting digestion can help relieve gas, bloating, or occasional indigestion. * When choosing an enzyme, do your research. Different enzymes support the digestion of different types of foods. The right combination of enzymes are based on targeting the digestion of specific macronutrients. Many enzyme formulas contain a broad activity while others more specifically address fat, protein, or carbohydrate digestion. Stay Hydrated: Staying hydrated allows the body to flush out normally occurring intermediate metabolites of foods and keep waste moving throughout the digestive tract. Dehydration increases occasional constipation and bloating.8 To make it simple, consume approximately half your body weight in ounces of water each day. This is not a perfect formula and may not be right for those who carry excess weight or have questionable kidney function. Exercise: Exercise has been found to enhance the diversity of the gut microbiota. Incorporating physical activity into your daily life improves fitness, as well as contributes to microbiota balance. Corey Schuler is the Director of Clinical Affairs for Integrative Therapeutics. He is a Certified Nutrition Specialist practitioner, licensed nutritionist, registered nurse, and chiropractic physician board-certified in clinical nutrition. He has a private integrative medicine practice in Hudson, Wisconsin. Dr. Schuler is an adjunct assistant professor at the School of Health Sciences and Education at New York Chiropractic College. He volunteers for the Board of Certification for Nutrition Specialists and is a member of Institute for Functional Medicine, American College of Nutrition, and American Nutrition Association. He has conducted dozens of national seminars, media, and podcast interviews including CBS-WCCO and other radio stations, Intelligent Medicine, Underground Wellness, Five to Thrive Live, Aging but Dangerous, Rebel Health Tribe, and countless online summit appearances. He is on the board of directors for the International Probiotics Association and an advisor to Functional Medicine University. 1. Bull, M, Plummer NT. 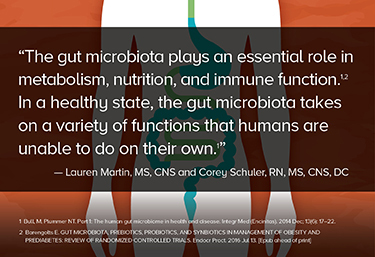 Part 1: The human gut microbiome in health and disease. Integr Med (Encinitas). 2014 Dec; 13(6): 17–22. 3. Ley RE, Bäckhed F, Turnbaugh P, et al. Obesity alters gut microbial ecology. Proc Natl Acad Sci U S A. 2005;102(31):11070–5. 4. Turnbaugh PJ, Ley RE, Mahowald MA, et al. An obesity-associated gut microbiome with increased capacity for energy harvest. Nature. 2006;444(7122):1027–31. 5. Tremaroli V, Bäckhed F. Functional interactions between the gut microbiota and host metabolism. Nature. 2012;489(7415):242–9. 6. Qin J, Li Y, Cai Z, et al. A metagenome-wide association study of gut microbiota in type 2 diabetes. Nature. 2012;490(7418):55–60. 7. Björkstén B, Sepp E, Julge K, Voor T, Mikelsaar M. Allergy development and the intestinal microflora during the first year of life. J Allergy Clin Immunol. 2001;108(4):516–20. 8. Arnaud M. Mild dehydration: a risk factor of constipation? European journal of clinical nutrition. 2003;57:S88-S95. 9. Clarke SF, Murphy EF, O'Sullivan O, et al. Exercise and associated dietary extremes impact on gut microbial diversity. Gut. Dec 2014;63(12):1913-20. 10. Chierico FD, Vernocchi P, Dallapiccola B, Putignani L. Mediterranean diet and health: Food effects on gut microbiota and disease control. International Journal of Molecular Sciences. 2014;15(7):11678-99.